I can’t say I have heard even a quarter of the albums that the label Zhelezobeton has to offer, but I think I Have heard enough to understand that each release from this label is probably going to be an interesting one. This album by Hypnoz, a moniker for Dimitry M.Zubov- who is responsible for various other projects, including seven other Hypnoz albums, is certainly a good example for the fine arsenal of Zhelezobeton. Adorned Gustave Dore’s art on its cover, “A Score for Iron Blues” holds ten tracks of lamenting industrial dirges. Through the heavily distorted industrial grinding, church bells and obscure voices can be heard, like in the wonderful track “Believe”, and create a welcomed contrast between the elements of the music of this album. True, it has been done a million times before, but Zubov can take comfort in the fact that not only that these combinations are done really well on “A Score for Iron Blues”, but through them, great emotional peaks are achieved on many parts of this album. The specific mood of this album is evident and persuasive from the first second to the last. Two guests can be found in this album. Mark Lougheed is responsible for noise vinyls on the first and last track, and Jim Thirlwell, well known as Foetus, offers his voice for the track “Night on Earth”, which is another great moment on the professionally printed CDr. 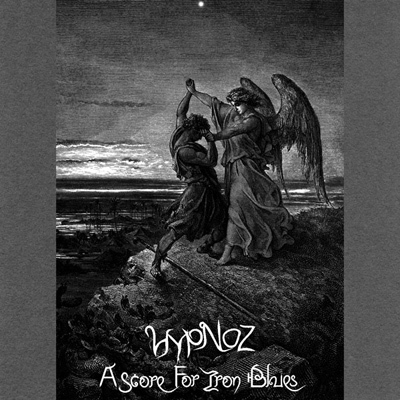 Printed in an edition of 150 copies, “A Score for Iron Blues” is a highly recommended album to look for, as Zubov is not likely to disappoint any fan of industrial to post industrial music.